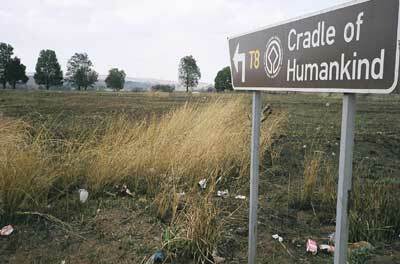 The notion of a "cradle of humankind", a more politically correct replacement for the "cradle of mankind", has a nice sort of appeal in the world of popular archaeology. It derives from Charles Darwin's prediction that Africa would prove to be the cradle, that place where our species was nurtured by Mother Nature. (I'm using both terms here for the sake of search engines.) My own impression of Africa is that it is so fecund, and has been for so long - it teems with life even today when the wildlife has been decimated - that it is almost as though the chances were that it would throw up some extraordinary creature. But the "cradle" is a bit sentimental given the reality that our remotest human ancestors must have faced a physically very tough, often violent, disease prone struggle to survive. But no doubt there were sweeter times, and cradles even back in the trees where they might have learnt a trick or two from the birds. The notion has an appeal that in places even attracts tourism. In my study one can see that I am an unashamed enthusiast for these places. There are more than a few of them, especially in Africa - Ethiopia, Kenya, Tanzania, South Africa all have sites that claim the title - but also some in Asia - Indonesia and China. India is looking for a breakthrough discovery. Here are some photos from trips I have made in the last few years. Sign near Sterkfontein, outside Johannesburg, South Africa. Here ancient humans invented rubbish. Just up the road, the sign at Swartkrans. 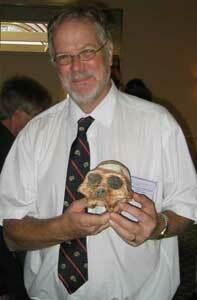 Dr. Francis Thackeray, at the time Director, Transvaal Museum, South Africa, at the World Heritage of Human Origins Conference, Mildura, April 2007. He is now Director, Insitute of Human Evolution, University of Witwatersrand. 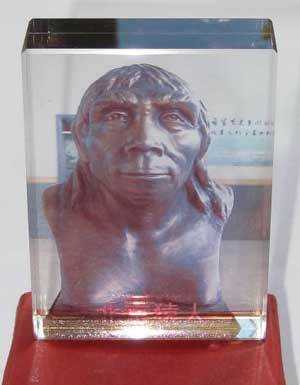 He is holding a replica of "Mrs. Ples" from The Cradle of Humankind World Heritage Site, South Africa. It is a specimen of Australopithecus africanus. 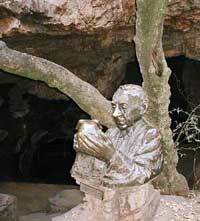 Statue of Robert Brooom of the Transvaal Museum holding the australopithecine skull known as "Mrs. Ples", outside the cave at Sterkfontein where he found it in 1947. The "Ples" derives from a prior taxonomic designation by Robert Broom - Plesianthropus transvaalensis - at the time of its discovery. 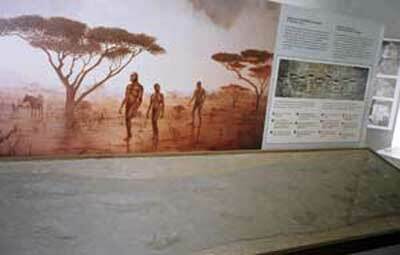 The Site comprises localities at Sterkfontein, Swartkrans and Kromdraai, which are contiguous, and just outside Johannesburg, and further afield at Taung and Makapansgat in the Transvaal. The fossils in these locations are Pliocene-Pleistocene in age, i.e. about 2 - 3+ million years. 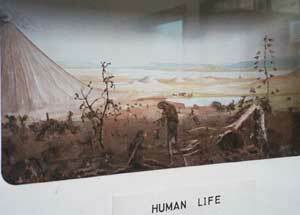 I have always found the study of human evolution very interesting. I don't know what percentage of the world's population know of this, or accept it. Of course there are many who reject it on religious grounds, but even secular critics have attacked Darwin. I think it is the great story to come from science. Not only is the story big, but so is the story of how it became to be written. It has come slowly and somewhat painfully since the late nineteenth century. It is also interesting how both stories manifest themselves in the popular culture. Every capital in Africa I saw has a museum with an account of the story; so do most science museums anywhere in the world. You can collect kitsch souvenirs from them. We'll be hearing a lot about Darwin in 2009. The story of how the story has been unearthed is a long-running drama; look at the lives of Eugene Dubois, discoverer of Java Man, of the Leakey family and other great contributors. Olduvai Gorge, Tanzania. 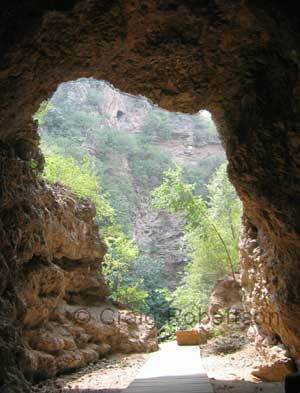 More properly called Oldupai Gorge, it is another claimant on the "cradle". 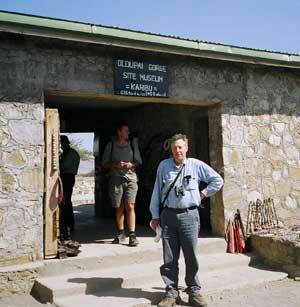 Olduvai site museum, overlooking the gorge. a restricted area about 45 kilometres away. 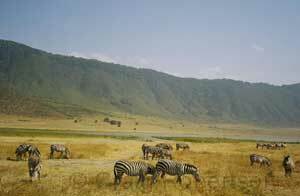 Zebras grazing in Ngoro Ngoro Crater, Tanzania, not far from Olduvai Gorge. 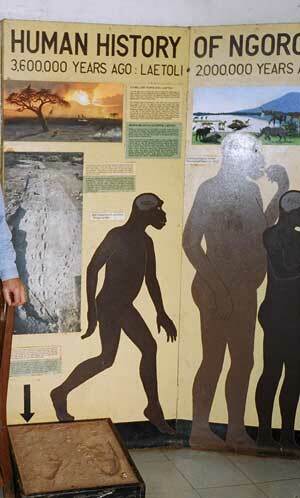 Part of the display in the gatehouse at the entrance to Ngoro Ngoro and Serengeti, Tanzania, showing human evolutiion. 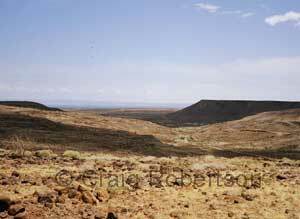 The road across the lava fields to Lake Turkana, northern Kenya. 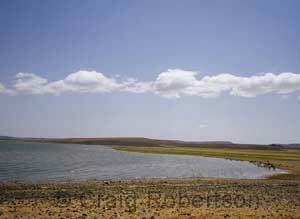 Lake Turkana, northern Kenya; far over the horizon is Koobi Fora, and Ethiopia, more "cradles". Even though a properly rigorous scientific attitude, or worldview, does not allow us to think that humans have any special importance, nevertheless the story that emerges from archaeology is still an enthralling drama. I find it hard to accept that it has all been some sort of fluke, a mere chance series of events, even when we consider that the asteriod that wiped out the dinosaurs would have missed the earth if it had have arrived 20 minutes earlier or later. As anyone who has studied science and mathematics can affirm, it is always important to understand initial conditions. They are at least as important as the dynamics that follow on in any system. What were ours? Was it arcadia or hell-on-earth? We don't really know what they were; life is of quite uncertain origin so far, and so is the moment when our ancestors went a different way to that of the chimps. One of the first things we have to get our minds around here is the immense age of the earth. See for example Basin and Range by John McPhee (Noonday Press, New York, 1980) who coined the term "deep time". As Prof. Bill Compston's work proves with scientific rigour, there's a good four billion years for life to evolve, and not just for the age of the earth, but the earth-moon system too; see the Bill Compston interview. Think of the tides coming and going twice a day every day for all the eons of time when so much of the evolution of life was taking place in the litoral between the high and low tidemarks, the plants adapting to standing out of the water, the animals crawling out and learning to breath the air. It's plenty of time for the thousands of generations required to establish the millions of species. I wouldn't be surprised if one day we can kickstart this process by beaming signals at complex minerals on distant planets, preparing them for settlement by humans who, as usual, arrive very late in the process. We all know the sort of analogies about how it happened on earth: if the age of the earth was the length of your arm, human history is like a single scrape of a nailfile off your finger; if the age of the earth is viewed as a single day, humans appear only in the last moments before midnight, and so on. (Strange how many people seem to be under the impression our ancestors knew dinosaurs.) But time is not the only thing that is important. In fact sheer duration is relatively less important than other things like morphology and behaviour. These things come, given enough time, and when they do they move to centre stage. In my novel The Expedition, the second part of the book is an attempt to dramatise the story of human evolution through the perceptions of a group of characters who, as it were, emerge in the course of the story in a series of steps. The first chapter of this section starts with a violent undersea birth and ends when two apes, mimicking the cranes on the open plains of Africa, stand up to dance in front of their gathered kin. This is a very long time span; it includes the move from water to land, and the end of the dinosaurs. The next chapter ends with the first self-referential sentence being spoken - a character speaks her name. Both of these steps take place in "the cradle". In the cradle we have the lullaby. Its gentle rhythms emulate the rise and fall of the wind and the swaying of the tree branches where mothers learnt to sing to an audience of one. Early speech followed the natural rise and fall of the breath; the first half spoken words were crooned to babies who grew to talk. The next chapter ends with the first sea voyage, and so on. The time duration between each of these major steps is at least an order of magnitude less each time. I believe none of this was a fluke, because even from long before they got up to dance they were trying it on, these characters, our ancestors. And they kept doing that all the way through the many stages of our evolution until the tribes came out of the deserts and founded cities. Then things changed of course. But trying it on hasn't stopped. The Expedition must always press forward. 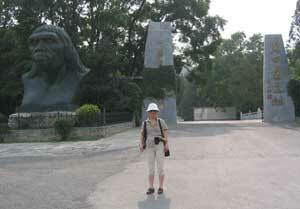 at Zhoukoudian, outside Beijing, China. rock face behind the cave, in 1929.
on Dragon Bone Hill, Zhoukoudian. and caves on Dragon Bone Hill, Zhoukoudian. 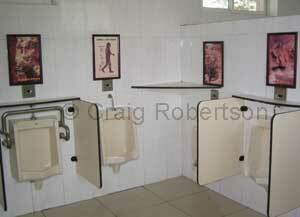 The Peking Man urinal, near the gate at Zhoukoudian. 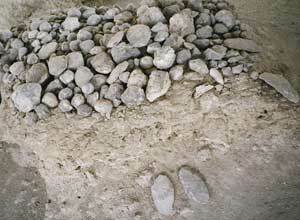 Back to home page and scroll down to see some rocks from "cradle" sites, in the collage nos. 4 & 5. Text © Copyright Craig Robertson, 2008, except where otherwise attributed.